Set on changing up your hair colour this winter? Us too. The key to nailing it is complementing your complexion because, as the seasons change, so too does your skin-tone. As you start thinking about switching up your wardrobe (hello lots of black?!) and beauty routine (give us ALL the moisture) for the cooler months ahead, it might just be the perfect time to try a fresh new hair colour. Shifting your hair colour one to two shades warmer as the mercury drops can instantly brighten your face and overall vibe. Australian hair brand evo predicts the top five colours trending this winter include glacial pink, soft grey tones, baby blues, deep rose golds and rich copper tones (umm, this actually makes us pretty excited about winter). We’ve translated these predictions into five new hair hues that are set to inspire your winter look. Winter doesn’t mean you have to darken your light locks. Switch up your bright, golden summer blonde for a silvery, slightly lighter blonde hue for winter (think blondes sitting right on the edge of a soft-grey). Ask for an ash blonde with light platinum highlights. Just remember that lightened hair requires lots of TLC, especially in winter. Try using a conditioning treatment every three to four days to keep your hair healthy and full of life. We love Pureology’s Colour Fanatic Instant Conditioning Whipped Cream, it’s a mousse-like product that only needs to stay on your freshly shampooed strands for one to three minutes to revive dull hair, detangle, moisturise and protect. For a look that’s classic, striking and ridiculously healthy, try a single-process colour in a shade of rich, black-ish brown. Trade in warm, sun-kissed brunette shades for a striking, super dark brown hue this winter and channel it-girls Bella Hadid and Kendall Jenner. Hair serums and gloss finishing sprays will also become your new best friend, our favourite at the mo’ is Biosilk’s Silk Therapy Treatment. It smooths and protects and is infused with real silk (hellooo, dreamy locks!). Brunettes can try adding a little warmth to their usual shade this winter—it’ll brighten any complexion. Blondes can channel Blake Lively and swap golden tresses for rose gold or burnt auburn hues (swoon). With dramatic colour changes, make sure you use a colour safe shampoo to stop your colour from fading while keeping your hair soft and shiny (no matter how much trauma you’ve put them through!). Make sure you also invest in a weekly conditioning treatment that has just a touch of dye in it to keep your strands looking fresh. Evo’s Fabuloso Pro Take-Home Conditioners are mixed by your hairdresser according to what shade you’ve just added. Bespoke conditioner and a fresh colour after each wash?! Love it. For brunette beauties, trade summer balayaged locks or sun-kissed highlights in for a winter-appropriate bronde by darkening your roots and using a smudging technique to highlight the hair. For winter, try cool blonde tones or warm light brown shades as opposed to warm golden tones, depending on your skin colour. Natural (or not so natural) blondes, try deepening your colour, especially around the roots or opting for more silvery tones as the seasons change. Always use a toning shampoo and conditioner (that are usually purple or blue) to keep brass at bay! Our pick? Kevin.Murphy’s Blonde.Angel.Wash. 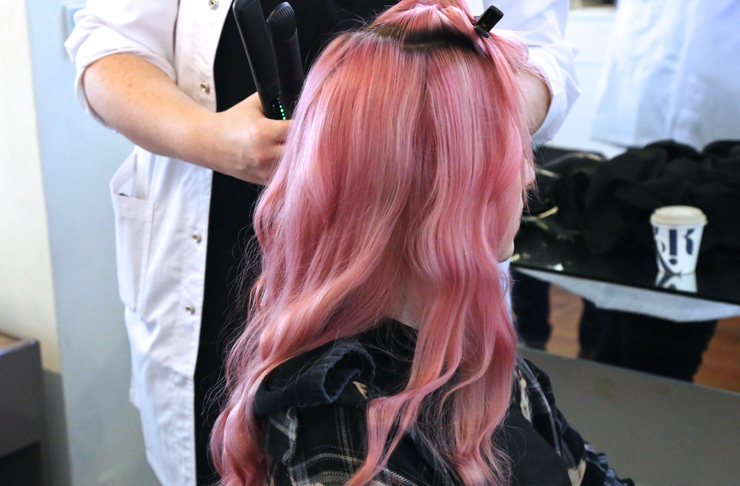 The next-gen of pastel hair hues that are trending for winter are inspired by the Pantone colours of the year, rose quartz and cool-icy blue. Whether you’re taking your hair to a whole new level and going baby-blue-all-over or are looking for a more subtle change, these colours can still look chic and polished if your hair is kept hydrated and healthy. Make sure you have your hairdresser recommend a gentle shampoo (such as evo’s Fabuloso ‘Preserve’ Colour Maintenance Shampoo), a colour intensifying conditioner and an at-home treatment.